PAIRS instructors play a vital role delivering programs that make a lasting, measurable contribution to the lives of course participants. With experience training more than 2,000 instructors and serving tens of thousands of participants, PAIRS has identified some of the most important qualities in effective facilitators. Overall the PAIRS Facilitator should be personable, have life skills, be trustworthy, responsible, caring, have a good sense of humor, healthy self-esteem, charisma, energy, enthusiasm, and life wisdom. Understands and respects the vulnerabilities of class participants. The overarching goal of PAIRS is to empower course participants with skills and strategies to establish positive attitudes, behaviors, and patterns of emotional expression that lead to healthy habits for loving family relationships. The PAIRS Facilitator plays a vitally important role establishing rapport, personal and organizational credibility, group safety, assuring ethical practices, guiding exercises, and empowering each participant’s personal journey through the curriculum. PAIRS is widely respected as the most comprehensive, effective marriage education program in the nation because of the consistent, positive, lasting impact courses have on the lives of participants. This impact has been repeatedly validated through extensive research on the experiences of thousands of diverse participants in PAIRS brief, evidence-based programs: PAIRS Essentials (8-12 hours), PAIRS for LIFE (12-16 hours), and PAIRS for PEERS (10-15 hours). In 2009, PAIRS Essentials Retreats for Wounded Warriors suffering from visible and invisible wounds as a result of combat deployment were selected by the Veterans Administration as "Best Practice" for marriage enrichment. While some marriage education programs include limited, helpful components of PAIRS, the specific sequencing and comprehensive approach of PAIRS Essentials and PAIRS for LIFE represent best practices validated by rigorous evaluation. A 2009 study of the longitudinal impact of PAIRS Essentials and PAIRS for LIFE for couples who began at the point of separation or divorce found significant, lasting improvements for 77% of the participants. A 2010 study of PAIRS Essentials found statistically significant benefits across diverse socio-economic and ethnic groups for participants in various stages of relationships. "While some marriage education programs address one or two components of the resources needed to sustain lasting loving relationships, such as communication or conflict resolution, PAIRS delivers a holistic approach that has been proven effective and enduring time and again. PAIRS Essentials and PAIRS for LIFE uniquely integrate the process, sequence, quality management, and range of relationship building experiences vital to producing lasting breakthroughs for couples and families." PAIRS Foundation prepares prospective course instructors to teach PAIRS Essentials, PAIRS for LIFE, and the PAIRS for PEERS high school program through a 32-hour PAIRS Level One Professional Certification training that is open to educators, health care professionals, clergy, counselors and others inspired by the opportunity to measurably contribute to strong marriages, families, relationships, and communities on behalf of a safer, saner, more loving world. The training process includes immersing participants in an experiential curriculum over an initial two days, including significant in-person contact with highly successful PAIRS Trainers, followed by one day to address teaching techniques, theory, ethical standards, marketing/promotion, enrollment, retention, research, and quality management, and a final day of participant teach-backs with peer and Trainer feedback, and graduation. 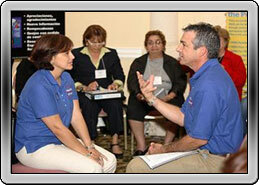 Training is offered in both English and Spanish. Graduates of PAIRS Level One Training are eligible to be licensed to deliver PAIRS Essentials, PAIRS for LIFE, and PAIRS for PEERS classes in their communities, receive online access to a range of supplemental and updated materials; promotional support through PAIRS online calendar and leader directory; mentoring from experienced PAIRS instructors; administrative assistance from the PAIRS national office; and, support in partnership development, quality assurance, evaluation and research. All PAIRS certification training is conducted under the auspices of PAIRS Foundation. To learn more about opportunities to become trained, licensed, and certified as a PAIRS instructor, contact: Gabriell Cornett, PAIRS Trainer, at (877) PAIRS-4U (724 7748), ext. 802, or email: info@pairs.com. A schedule of upcoming programs open to the public is available from our online calendar. "PAIRS tools made an immediate difference in our relationship. We’d been to other programs that focused on concepts and values and seemed bent on inflicting their own version of spirituality and religion but didn’t give us anything practical. We were glad to see PAIRS impact people of different faiths and backgrounds in an environment that respects individual values and beliefs." Click here to learn about PAIRS research.